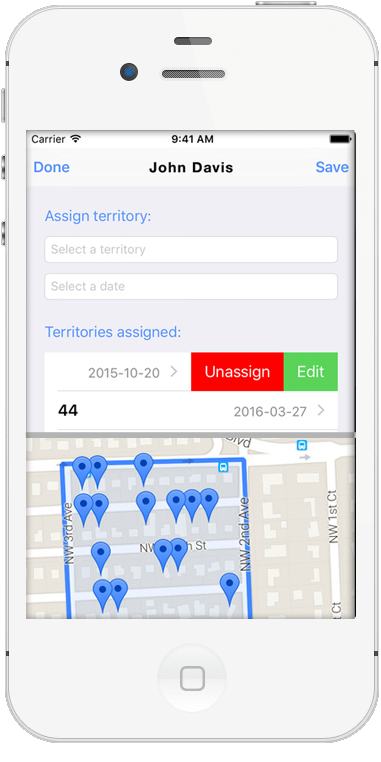 Territory App is a web and mobile app developed to provide easy-to-use system for accessible storage and management for congregation territories. It connects to the Territory Services Api RESTful api to consume and post data. Using the mobile app requires a Server Url for your congregation territory. The Territory Services Api can be installed on any cloud server that supports PHP 5.3 and higher. After installing the Territory Services Api web application, your Server Url will be the web address plus the the path for the api version (v1). For example, if the Api is installed at the url, "http://mycongregationsite.com", the Server Url for your application would be "http://mycongregationsite.com/v1". Be sure to use the correct path (v1, v2, ...) for future versions. Territory Services Api is a RESTful api developed to allow data storage and management for congregation territories. Many systems can connect to the Territory Services API via mobile and web client, it contains an authentication layer using Jason Web Token (JWT).